Men are always the hardest to buy for, I reckon. It can be hard to know whether they're into skincare (my husband barely touches it), or whether that bottle of aftershave you're contemplating is going to be collecting dust alongside a dozen others in their bathroom cabinet. 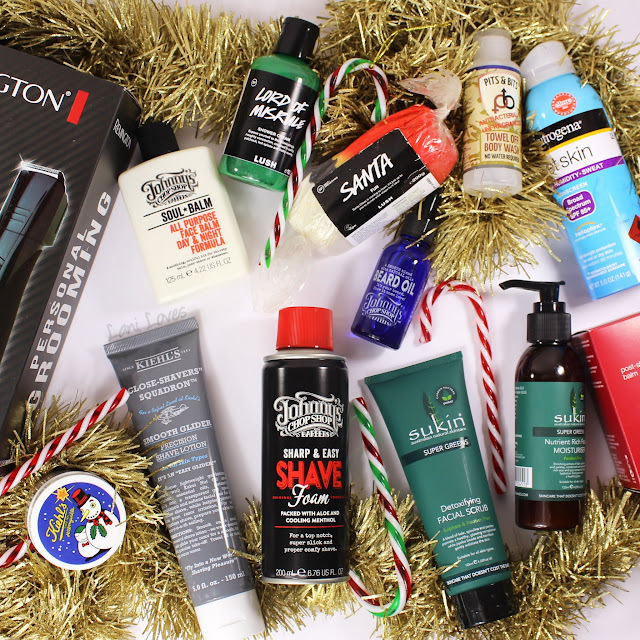 But with a bit of research it is possible to find the perfect gift for the guys on your Christmas list and I've got a bunch of suggestions to get you started! Unless they're rocking a Dumbledore-worthy beard, the guys on your shopping list probably need to shave occasionally, so why not restock their bathroom cabinets with shaving creams and post shave balms to make it a more enjoyable chore? Kiehl's Close-Shavers Squadron Smooth Glider Precision Shave Lotion (RRP $40NZD) is a thin, nourishing lotion that makes it really easy to get a close shave with no water required. The fragrance is light and subtle, excellent for guys who don't like a strong scent to their products. For a more traditional shaving foam, Johnny's Chop Shop Sharp & Easy Shave Foam (RRP $17NZD) boasts some sweet, retro barbershop inspired packaging and the creamy shaving foam inside has aloe and menthol to soothe skin. For post-shave care, Johnny's Chop Shop Soul Balm All Purpose Face Balm (RRP $17NZD) is quick to absorb but super hydrating with a lightly musky, classic scent. If you're feeling a bit spendier, the Dermalogica Post-Shave Balm (RRP $49NZD) packs in even more hydration and is slightly mattifying, with oil-controlling properties to boot. Of course, if he is rocking a Dumbledore beard (or even one of more modest proportions), he'd probably enjoy a beard oil to soft and condition that facial fuzz. Johnny's Chop Shop Beard Oil (RRP $17NZD) is one my husband has been enjoying; it's got very little scent, which makes it perfect for his sensitive nose and keeps his beard groomed and easy to manage. A personal grooming tool never goes astray and Remington's Barber's Best Personal Groomer (RRP $99.99NZD) covers virtually every need. 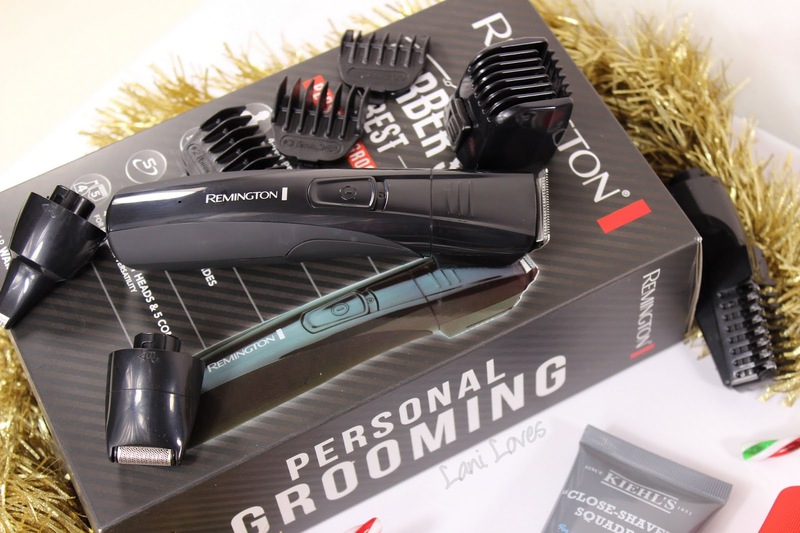 There are multiple attachments to trim and groom beards, stubble, moustaches, nose and ear hairs, plus it's cordless with a 60 minute operating time before it needs to be recharged. I just spotted that it's currently on sale for 40% off at Noel Leeming until the 13th of December too, score! 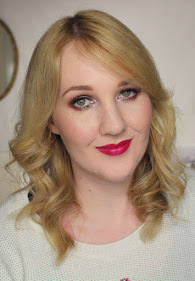 Moving onto skincare options, where it pays to either know your audience well or get something fairly versatile. 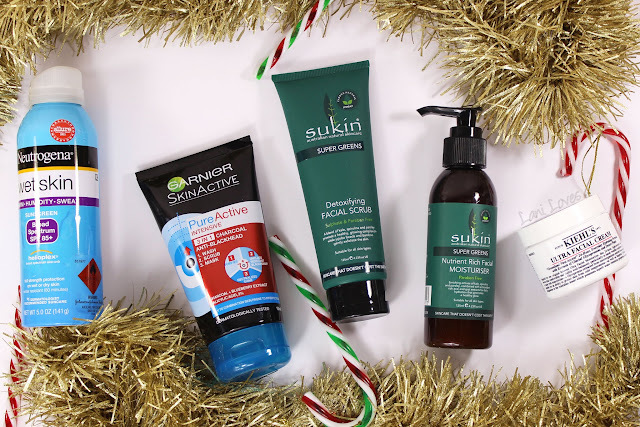 Sukin's range is unisex but I thought I'd include them in the mens gift guide because my brother (who has pretty awesome taste) is a big fan! Their Super Greens range (RRP $16.99-28.20NZD) blend kale, spirulina and parsley with other skin-loving ingredients like rosehip, jojoba, bamboo and acai to brighten and nourish skin. They're suitable for all skin types, too, which takes out the guess work for you! Garnier Pure Active Charcoal Anti-Blackhead 3 in 1 Wash/Scrub/Mask (RRP $13.99NZD) covers all your bases and is great for any guy who appreciates a bit of skincare but doesn't want a bunch of different products jumbling up his skincare routine. It smells really good too, lightly of blueberries but not in an overly sweet way. If you're shopping for someone who's up on his artists, he's sure to love the limited edition packaging of the Jeremyville X Kiehl's collaboration - you can see the adorable snowman design on the lid at the top of this post. There are a couple of classic Kiehl's products included in the range, including the Calendula Herbal-Extract Toner, Richly Hydrating Hand Cream, Creme De Corps and Ultra Facial Cream (RRP $54NZD, pictured). These are all totally unisex-friendly products, so would really suit anyone! Don't forget your most important skincare - sunblock! Neutrogena Wet Skin Sunblock Spray (RRP $18.99NZD) is one of the most fought over items in our house - we seriously need one in every room! My sons hate having liquid sunscreen applied, my husband always misses applying it to the back of his neck properly before sports and I get burnt just hanging out the washing (I wish I was exaggerating) so spray on sunblock is a total godsend for us and a must for Christmas stockings. If you know someone who's pretty sporty, or into the great outdoors, the Pits & Bits Towel Off Body Wash (RRP $6.55NZD) is a nifty wee gift. It gets you nice and clean without any water required - this bottle went straight into hubby's football bag for when the locker room showers are out of order, but we'll probably bring it to Great Barrier Island on our annual summer holiday too, as water restrictions are always in place there. The Zerreau Towel Off Shampoo is a similar concept and comes in apple or strawberry scents. Genius! 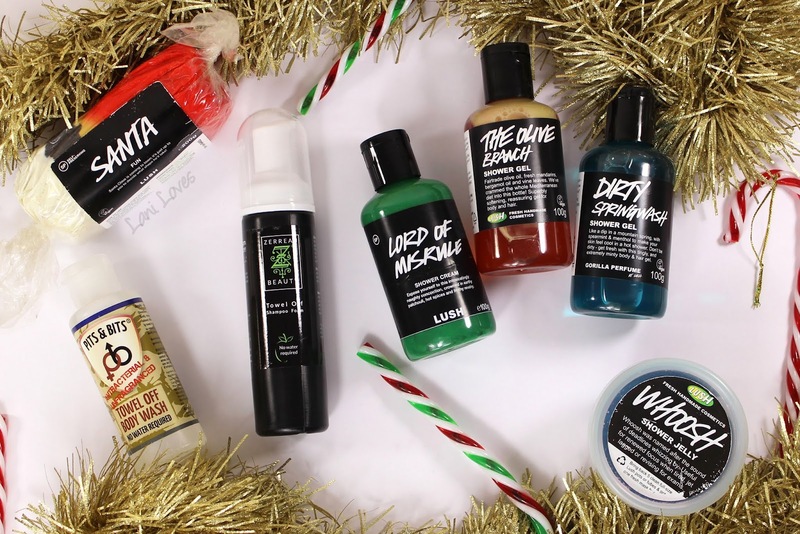 What better way to round off a Christmas suggestions list than with some awesome goodies from LUSH? I've done a lot of my Christmas shopping for the hard to buy for guys in our family at LUSH this year and I mean A LOT. 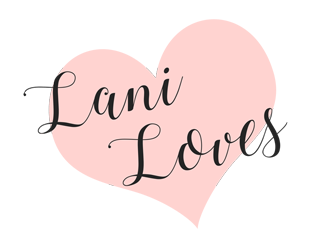 They have so much to pick from and they straddle the line of being both a bit fancy and budget friendly, with prices starting from around $6.90NZD for soap and $8.90 for the 100g shower gels. Pictured is Santa FUN ($12.90 for a 200g pottle, mine is in gift set packaging), a multi-use product you can shape and mould like play-doh and Whoosh Shower Jelly ($8.50NZD/100g, $14.90NZD/240g), a citrus and rosemary scented wobbly washer that will have anyone feeling young again. For shower gels, I have a few picks: Lord of Misrule Shower Cream ($13.50NZD/100g, $23.50NZD/200g, $34.90NZD/500g), a lurid green patchouli & peppercorn fragrance that's part of the Halloween & Christmas range. Or from the permanent range, The Olive Branch ($8.90NZD/100g, $16.90NZD/250g, $25.90NZD/500g), a mandarin, olive & bergamot concoction that's mild enough to appeal to anyone while Dirty Springwash ($11.50NZD/100g, $19.90NZD/250g, $29.90NZD/500g) is a classic mens scent with a blast of spearmint and menthol, tempered with thyme. I haven't shown them here, but my own shopping list also consisted of Big Blue Bath Bomb ($6.90NZD), Outback Mate soap ($8.40NZD/100g) and Sea Vegetable soap ($8.10NZD/100g). There are some spoilt blokes around here! How is your Christmas shopping going? 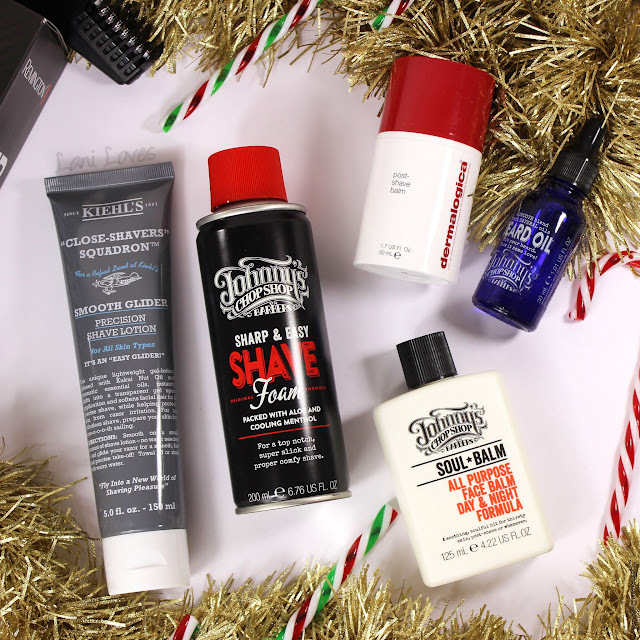 Do you have any difficult-to-buy-for guys on your list?